Here’s something that I find incredibly amusing. An expert in one subject being asked an opinion in an related subject and then answering the question with misinformation. You would think that a scientist would want to know the facts before he made a claim that is so easily refuted. I’m thinking here of Phil Plait and his Bad Astronomy column in which he talked about UFOs just a couple of days ago. He was suggesting that when he lectured, he was often asked if he believed in aliens and flying saucers. His answer was, "Yes and no." Amateur astronomers, of course. They are dedicated observers, out every night peering at the sky. If The Truth Is Out There, then amateur astronomers would be reporting far and away the vast majority of UFOs. But they don’t. Why not? Because they understand the sky! [Emphasis in original] They know when a twinkling light is Venus, or a satellite, or a military flare, or a hot air balloon, and so they don’t report it. That, to me, is the killer argument that aliens aren’t visiting us. If they were, the amateur astronomers would spot them. 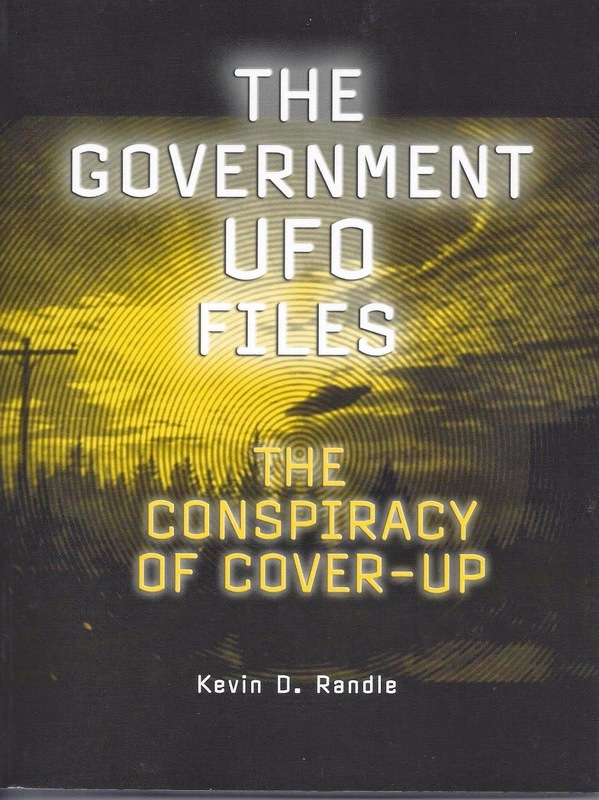 The problem here is that astronomers, both professional and amateur have reported UFOs, and if we add in atmospheric scientists, we increase the pool of those who understand the sky and who have reported UFOs. Certainly. The one that springs immediately to mind is Clyde Tombaugh who was credited with discovering the now dwarf planet, Pluto. In 1949, at 10:45, Tombaugh, his wife and his mother-in-law saw something strange in the night sky. The full report is now housed at the J. Allen Hynek Center for UFO Studies in Chicago, and I have held the original report in my hands (and I wonder what that document would bring on eBay?). Tombaugh wrote, "I happened to be looking at the zenith... when suddenly I spied a geometrical group of faint bluish-green rectangles of light... As the group moved south-southeasterly, the individual rectangles became foreshortened, their space of formation smaller... and their intensity duller, fading from view at about 35 degrees above the horizon... My wife thought she saw a faint connecting glow across the structure." I’m sure that we’re about to hear that Dr. Donald Menzel, the UFO debunker and critic of anyone who suggested that any UFOs are anything other than misidentifications or hoaxes, was able to solve the sighting. He suggested that "a low, thin layer of haze or smoke reflected the lights of a distant house or some other multiple source." Tombaugh, who saw the objects replied to Menzel, who didn’t see them, writing, "I doubt that the phenomenon was any terrestrial reflection, because in that case some similarity to it should have appeared many times... nothing of the kind has ever appeared before or since." Well, a UFO sighting by one astronomer does not make the complete case, so let’s take a look at that paragon of scientific investigation, the Scientific Study of Unidentified Flying Objects now almost universally called the Condon Committee. They, of course, didn’t bother with their own research, but quoted from Project Blue Book Report No. 8 dated 31 December 1952. The Blue Book astronomical consultant (which they don’t name but everyone today knows it was Dr. J. Allen Hynek, seen here) interviewed 44 astronomers about their attitudes about UFOs and found, not surp risingly, that most were completely indifferent to UFOs, or at best, mildly interested. Only eight said they were very interested. The important point here is that five of them, according to Hynek, "made sightings of one sort or another. This is a higher percentage than among the populace at large. Perhaps this is to be expected since astronomers do, after all, watch the skies." Hynek said that when he told these astronomers that there were some cases that were highly interesting and in which there was no easy solution, their interest was "almost immediately aroused." This, of course, goes back to the original comment that amateur astronomers don’t see flying saucers and if they don’t, then there simply can’t be anything to them. But here we’re talking about the professionals, who confided in Hynek because he was a colleague. Hynek, because of his position with Project Blue Book had some inside knowledge about UFOs and he was taking the whole thing seriously. Hynek, in his report added another comment that explains part of this perception that astronomers don’t see UFOs. Hynek noted, "And certainly another contributing factor to their desire not to talk about these things is their overwhelming fear of publicity. One headline in the nation’s papers to the effect that ‘Astronomer Sees Flying Saucer’ would be enough to brand the astronomer as questionable among his colleagues." So now we learn that astronomers do see UFOs and they do not report them for fear of professional ridicule. I heard one professional astronomer, in the 1970s, when asked what he thought of Hynek’s work reply, "Allen always wanted to discover a new constellation." What that tells us is that Hynek’s interviews of two decades earlier were still true in the 1970s, and we know that it is true today. We still have the professional scientists making pronouncements on the topic without benefit of personal knowledge. They are all too willing to dismiss the topic without bothering to learn the facts because, to do so, they would have to wade through oceans of ill-informed skeptical comment, such as Menzel’s dismissal of Tombaugh’s sighting. But let’s ask one other question. When does anecdotal testimony become scientific observation? When does the training of the person making those observations suggest some sort of expertise? Does a pilot, military or commercial, with tens of thousands of hours in the cockpit, who is familiar with what is in the sky, make anecdotal statements or refined scientific commentary? What about the use of instrumentation? Charles Moore (seen here), the man who claims to have launched the balloon array that explains the Roswell UFO crash has his own, unexplained UFO sighting. On April 24, 1949 Moore and four Navy technicians in New Mexico were tracking a weather balloon using a theodolite that consisted of a 25-power telescope equipped to provide readings on vertical and horizontal bearings. Given his observations as it passed in front of a mountain range, he estimated the UFO was traveling at 18,000 mph, before it disappeared in a sharp climb. Here was a man who was familiar with the sky, who watched the object through a theodolite so that he could make educated estimates of the object’s ability, and who reported this to Project Blue Book. The sighting is labeled as "unidentified." Menzel, of course, knew that this couldn’t be anything extraordinary. According to him he could identify the object. In a conversation with Moore, Menzel said that it was no object at all but a mirage, an atmospheric reflection of the true balloon, making it appear as if there were two objects in the sky instead of one. He was so sure of this that he told Moore about the solution. Moore, however, describes himself as an atmospheric physicist and considers himself as qualified as Menzel to discuss the dynamics of the atmosphere. And, according to Moore in an interview I conducted on El Paso radio station KTSM, the weather conditions were not right for the creation of mirages that day. Since Moore was on the scene, and since his training qualified him to make judgements about the conditions of the atmosphere, his conclusions are more important than Menzel’s wild speculations. Moore is no fan of the extraterrestrial, as evidenced by some of his statements about the Roswell case and UFOs to various writers, including me. But, his sighting stands as one that should be counted as a scientific observation rather than as mere anecdotal testimony. I could go on, but what’s the point. I have refuted the original idea that astronomers do not see UFOs. I have provided the documentation for this claim, and for those interested in Moore’s sighting, it is housed in the Project Blue Book files. Only the names have been removed, but we can, in most cases, put those names back in. In my Project Blue Book - Exposed, I have a listing of all the Blue Book unidentified cases. So, now that we know that astronomers do see UFOs and some even report them, where do we go? These scientists are familiar with the sky, they understand what is in the sky, but sometimes they see things that are extraordinary and that do not fit into the nice little categories we have created for them. Sometimes, you could say, they see flying saucers. 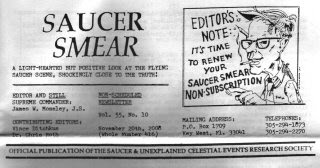 Jim Moseley of Saucer Smear (the second oldest continuously published UFO "zine" if you count its various incarnations and seen below with a drawing of Moseley) and I have been in a bit of a dust-up about Jesse Marcel, Sr. and the champion of the Mogul theory, Charles Moore. The latest started wh en I suggested that Moore, based on the documentation available, had been told Mogul’s name long before Robert Todd arrived in 1992 to tell him. The point had been that Mogul was so secret that even those who worked on it had not known the name until more than forty years had passed. Documentation, from the Air Force showed Dr. Albert Crary, the project leader had known the name in 1946 and had mentioned it in his unclassified diary a couple of times... a clear security violation unless, of course, the name wasn’t classified as we had been told. In a letter dated in 1949, Moore was introduced to James A. van Allen as one of the Project Mogul engineers. This letter, too, was unclassified and another security violation if the name had been classified. And, importantly, it came from Moore’s files, proving that he had known the name before Todd told him. Now before we go farther, let me point out that I believe that Moore had forgotten the name when he told researchers he hadn’t known it until Todd told him, and there was nothing more nefarious in his claim than that. However, we can no longer say that Mogul was so secret that even those working on it didn’t know the name. Clearly, based on the documentation, they did. I pointed all this out to Jim Moseley and asked him if we didn’t label Moore a liar for his mistake, shouldn’t we grant the same courtesy to Marcel? Rather than answer that question, Moseley sent me copies of articles that were more than a decade old and in which these same mistakes about the secrecy of Mogul were repeated. He also sent articles, more than a decade old in which Marcel is characterized as a liar and far worse, though his offenses seem to be no worse than those committed by Moore. Clearly all this information was outdated. So, let’s look at some of these criticisms. Marcel told Bob Pratt, then of the National Enquirer that he had flown as a pilot, bombardier and waist gunner while in the service. Todd, and by extension Moseley, suggests that this proves that Marcel was less than candid when he was interviewed based on what Todd found when reviewing Marcel’s service record. There was nothing there to indicate that Marcel had flown in those positions. But I believe the wording in Marcel’s statement is crucial and has been overlooked. Marcel said he had flown AS a pilot, bombardier and waist gunner, not that he served in any of those positions in any official capacity. For those who have never been in an aviation unit, Marcel’s claim isn’t that farfetched. Those who have no rating, meaning they are not on flight status, are often provided with an opportunity to fly in aviation positions. I have flown as a helicopter door gunner, but you’ll find nothing in my record to support that. And, I have given "stick time" to door gunners and crew chiefs but you’ll find nothing in their records to reflect that. The point is that all of us can say, truthfully, that we flew in those positions. Todd, and by extension Moseley, also make a big deal out of Marcel’s claim to have been a private pilot because there was no record of a license with the FAA. This is true because I asked the FAA about it and although their records do go back into the 1920s, when Marcel would have started flying and the government began to attempt to license pilots, this really isn’t the whole story. If you check out the FAA site and take a look at the licensing history, you’ll learn, as did I, that in the 1920s the forerunner to the FAA tried to induce private pilots to voluntarily get licenses without much success. It wasn’t until the mid-1930s that most pilots were finally licensed and it wasn’t until after the Second World War that there was a real requirement for a license. Even with that many who had started flying in biplanes didn’t bother with the licenses. It could be argued here that Marcel, having no need to fly any more, simply didn’t bother. Before the war he had been a cartographer with Shell Oil but after the war and after he left the Army his interest shifted to electronics and any interest he had in aviation ended. What this suggests to me is that much of what Todd claimed about Marcel simply is unimportant. It proves nothing about Marcel’s veracity. Everything Marcel said could be true and the lack of documentation in the military files is simply irrelevant given the many circumstances surrounding the creation of military records. Just ask about any veteran if his or her records are accurate and you’ll learn that few are. Now, if we want to be completely fair in this brief analysis, we have to look at one other aspect of the Pratt interview. According to what Pratt wrote in his transcript, Marcel, Sr. said, "I was working for Shell Oil Co [note, I’m going to reproduce this as closely to the transcript as I can rather than use Karl Pflock’s cleaned up interpretation] as a photographer when the war began. all my map making for the engineers and Shell oil co was derived from aerial photographs... no degree then. got one later, 6 diff schools..."
Later in that same Pratt interview, Marcel said, "...degree in nuclear physics (bachelors) at completed work at GW Univ inWash. attended (LSU, Houston, U of Wis, NY Univ, Ohio State , Docotr pool? [In Pflock’s cleaned up version, that last part is marked as unintelligible and while it doesn’t make sense, it certainly is relevant to our discussion] and GW..."
So, what do we know. Well, Todd and others make a big deal that Marcel’s military record showed only a year and a half at LSU. There seems to be no dispute with that. Could it be that Marcel received his degree after his military service? Could it also mean that while in the service he took extension courses offered to members of the service by various universities, often with the classes taught on the bases? Here’s all we really know about this. GW has no record of a degree being issued to Jesse Marcel but then Marcel didn’t really say that in the interview. Marcel was assigned to the Washington, D.C. area after his service in Roswell so it’s not impossible for him to have attended extension courses, which we might now call distance learning, while there and I have been unable to learn if GW offered any such classes and who would have kept the records of them. I suspect that the wrong questions were asked, so I’m now trying to find these answers which I’ll report on when I get them. The fact that Marcel’s military record contains nothing about this could be irrelevant. If the schooling was taken after his military service, then it wouldn’t be in there. My Army records show that I have a high school diploma and little else. The Air Force required me, after several years of service, to prove I had a bachelor’s degree even though the source of my commission was ROTC and the only way to receive a commission that way was to have graduated from an accredited college or university. Just one more example of how fragmented these records sometimes are. After all these years, it seems to me that a new set of questions needs to be asked about Marcel’s college career. I don’t believe the right questions were asked originally so now we have to go back and do it again. Those claiming that Marcel lied about his college education might have been so caught up in proving Marcel a liar that they ran with the first negative results they received. Maybe a little digging will resolve this. I’m going mention one other thing here. Todd, in his publication The KowPflop Quarterly, suggested that he had asked Jesse Marcel, Jr. about some of the discrepancies with what his father had said. In a quite reasonable conclusion, Todd wrote, "Marcel hasn’t even acknowledged my letter, much less furnished an explanation for this rather significant discrepancy." But Todd’s letters to Marcel, Jr. were certainly not reasonable. Todd, as was his habit, turned nasty in his communications with those who didn’t agree with him. In a letter to another researcher, Todd wrote, "I have already been told that he [Friedman] and Randle both have been slandering me at every opportunity. Apparently these two shameless liars..." and this is one of his less inflammatory statements. About Jesse Marcel, Jr., he wrote, "It should be noted that Jesse Marcel, Jr., now conveniently claims his father told him he had some ‘bootleg’ flying time which presumably wasn’t documented [which, of course, is the definition of bootleg time]... Given Major Marcel’s numerous other lies, and the younger Marcel’s obvious and understandable desire to salvage his father’s credibility, there is no reason to take the younger Marcel’s claim seriously." You might say this is still fairly tame, though he does manage to call Jesse Marcel, Sr. a liar and suggest that Jesse Jr. is lying as well. But then we have a May 10, 1996 letter from Todd that begins, "Dear Junior," meaning Dr. Jesse Marcel, Jr. Not exactly the kind of salutation you put on a reasonable letter to a physician. Todd then wrote, "The spelling, punctuation, and capitalization errors in your ‘960420' letter didn’t surprise me, given the level of ‘intelligence’ you’ve demonstrated in the past. The disgraceful obscenities didn’t surprise me either, given the scum with whom you’re known to associate. Likewise, the fact that you actually bothered to send me a letter, telling me that your letters are a waste to me, is a clear demonstration of the cutting edge ‘logic’ I’ve come to expect from the hysterical little girl who has come to be know as ‘the alien spaceship doctor.’"
I will note two things about the above. It explains why Todd didn’t get responses to some of his letters, and on this one, Jesse Marcel, Jr. wrote, "I did not send a letter with this date [960420 which I suppose it Todd’s convoluted dating system for April 4, 1996] to him." Todd was often nasty, didn’t believe anyone had the analytically ability that he did and believed all his conclusions to always be right. There was no room for disagreement in his world. 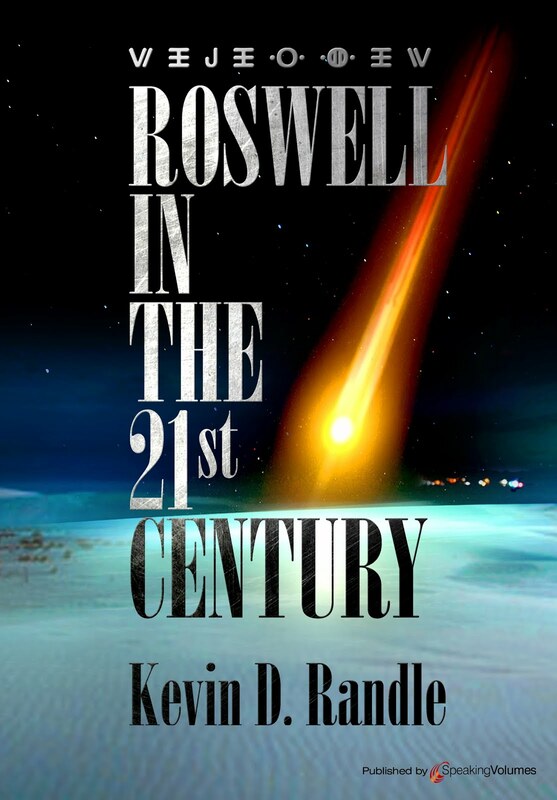 I mention all this, because it was Todd who worked so hard to destroy the reputation of Jesse Marcel, Sr. believing, I guess, that if Marcel crumbled, then the whole of the Roswell case crumbled. Had Marcel been the lone voice, that would have been true, but Marcel was backed up by every officer on Colonel Blanchard’s 509th Bomb Group staff with a single exception. Marcel had lots of company. Moseley, who knows most of this about Todd, still believes the Mogul balloon story despite mounting evidence to the contrary and Moseley still believes that Todd contributed something to the case with his release of Marcel’s entire military file. But Todd drew conclusions from the slightest information and proved time and again that he had no knowledge of how the military worked. Moseley has almost none himself, despite the fact that his father had been a major general and one time the Vice Chief of Staff of the Army (when major generals held that post). Moseley clings to the ridiculous Project Mogul answer for the Roswell case while many others admit now that Mogul is not the answer. But the real point here is that Moseley still believes that Marcel lied to Pratt when the evidence isn’t as cut and dried as he thinks it is. He relies on what Karl Pflock wrote about Marcel and Pflock relied on Todd and Todd simply didn’t understand how the military works. Todd believed that everything in the record was totally accurate and when it disagreed with what a witness said, then the witness must have been lying. I have sent Moseley another letter asking him the same question again. If we grant Charles Moore the benefit of the doubt when the records clearly show them in conflict with his testimony, then don’t we owe the same courtesy to Jesse Marcel, Sr.? All of these discrepancies are over relatively minor points and can be explained by the fog of time and the frailty of memory. I still await his answer. There has been a disturbing story circulating on UFO UpDates and told by Billy Cox on his blog and who is a real friend of the UFO community. According to these stories, Stan Friedman was to lecture at a science museum and that invitation was challenged by a "real" scientist, Paul Cottle, (see http://www.flascience.org/wp/?p=768)) who suggested that the study of UFOs is a "pseudoscience" and thought of Friedman, according to these reports, as a "charlatan." Now, as many of you know, Stan and I have had our differences over the years. Simply look at the arguments about MJ-12 and you’ll understand some of it. But this really is too much, no matter what you think of Friedman, his theories, and his research. These "scientists", and all too often the members of CSI (which used to be CSICOP before they changed their name) have long thought they needed to protect us unwashed heathens from those attempting to sell us snake oil. They have decided that we are incapable of discerning the truth for ourselves and always there to force the truth down our throats even if that truth smacks of their own dogma. I won’t bother with a long list of things that scientists knew before the evidence finally overwhelmed them forcing them to reevaluate their positions. The history of science if loaded with things that we all just knew to be real until the radical new ideas were forced on us. I’m thinking here of germ theory, genetic mutation and the demise of the dinosaurs, just to name a few. In this case the "scientists" who know relatively nothing about UFOs decided that they weren’t worthy of study. After all, didn’t Dr. Edward U. Condon study the flying saucers in the late 1960s and conclude that they weren’t anything to be taken seriously by science. Aren’t they "often-debunked pseudoscience?" No further study required. Isn’t it true that there is no evidence of these alien visitations, so we can ignore the testimony of airline pilots entrusted with the lives of hundreds, of police officers who clearly don’t understand what is in the sky around them, and all sorts of professionals who have reported UFOs in the past including such scientists as Clyde Tombaugh? Can’t we ignore the solid movies and photographs taken in the past? Haven’t reputable scientists found the pictures to be faked? Aren’t the reports corroborated by radar merely the mistakes of the air traffic controllers and others who are supposed to know the difference? Can’t we ignore the evidence collected at more than 4000 landings around the world? Didn’t the Air Force prove that the 1947 Roswell UFO crash was nothing more than a Project Mogul balloon array... even though there were no unaccounted for launches, the balloon array would have been recognized for what it was, a balloon array, by those who found it and there is no record of a Flight No. 4 which was identified as the culprit by the skeptics. Can’t we just ignore the testimonies of those hundreds who were involved in the clean up because it doesn’t fit into our "accepted" reality? Years ago I had the opportunity to interview James A. van Allen, a scientist I believe everyone can respect. The topic was the idea that the Tunguska explosion of 1908 was the result of a failure in the power plant of an alien spacecraft. Van Allen knew the topic and granted me a couple of hours of his time. Several things struck me at that interview. One, he was gracious enough to talk to me about a subject that might have been considered pseudoscience. Two, he had studied the Tunguska case because it interested him. And three, rather than rejecting what I said about it, he would ask, "What’s your source on that?" He was of the opinion that a comet had disintegrated about five miles high and the resulting explosion, which would have been massive, was the reason that impact site resembled ground zero where atomic bombs had been tested. We also talked briefly about UFOs on another occasion and he seemed to be willing to listen to the evidence. He wasn’t about to make a pronouncement based on what he thought to be the evidence, but rather on what the evidence showed. He did say that if you were in the middle of Wyoming and heard the thunder of hooves, you don’t expect zebra. Which means, of course, you must eliminate the mundane before you graduate to the unusual. With today’s keepers of the flame, those who profess to have the light while the rest of us wander in the dark unable to find our way, can we expect anything other than immediate dismissal? Without looking at a shred of evidence, they are able to tell us what is and what isn’t. This debate, such as it was, next turned to Dr. Gregory Boebinger, the director of the National High Magnetic Field Laboratory in Tallahassee. He asked "Is the Brogan [the Mary Brogan Museum of Art and Science in Tallahassee which hosted Friedman’s presentation] planning to host future exhibits on palm reading and astrology? Surely, when a science museum hosts often-debunked pseudoscience, it is not only using ‘a variety of entertaining experiences to attract audiences to science,’ as Ms. Barber [the Executive Director of the museum] contends, but it also insidiously endorsing pseudoscience and attracting our children and the public away from science." Nothing like reducing UFO study to that of palm reading and astrology. Nothing like calling UFO research pseudoscience without knowing a thing about it. In fact, in 1967, Condon delivered a lecture to scientists in Corning, New York telling them, "It is my inclination right now to recommend that the government get out of this business. My attitude right now is that there is nothing in it. But I am not supposed to reach a conclusion for another year." So much for science. Condon did reach the conclusion that there was no threat to national security, which was one of his missions, but he also concluded that no further study was required, even after more than thirty percent of the reports in his study were not identified. Even after one sighting was identified as a phenomenon so rare it had never been seen before or since and certainly doesn’t tell us what it was. So much for science. These other scientists, Cottle and Boebinger for example, are certainly familiar with the Air Force study of UFOs known as Project Blue Book (yes, that is sarcasm) and although the Air Force claimed they had identified all but three or four percent of the sightings, the true number is considerably higher. The Air Force often labeled a sighting as "Insufficient for Scientific Analysis," which, of course, doesn’t explain it, but kept it out of the "Unidentified" category. The evidence, all the evidence that science could want, is out there. Instead of looking at it, we had scientists such as Donald Menzel who called the pictures taken by Carl Hart, Jr. over Lubbock, Texas a hoax without proof or evidence of a hoax. The problem for Menzel was that if those pictures hadn’t been faked by Hart, then there was no earthly explanation for them. So much for science. And in keeping with that tradition, Cottle and Boebinger have not bothered to respond to these questions and points. Cottle just said that his letter to the editor was his message to the local community. Boebinger has yet to respond. 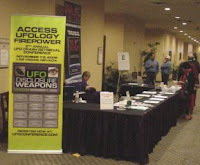 At the 6th Annual UFO Crash Retrieval Conference in Las Vegas (registration area seen here), George Knapp told of a UFO crash along the Colorado River near Needles, California on May 14, 2008. Make no mistake here. There was a UFO crash, but also remember that UFO doesn’t necessarily translate into extraterrestrial. Knapp told th e audience during his Keynote address that he had investigated the case from the beginning, talked to the witnesses, and learned that five helicopters had flown into the area within minutes of the crash. Something real had happened. According to witnesses, about three in the morning, a cylinder-shaped object with a turquoise glow, fell out of the sky and crashed west of the Colorado River. A witness, known as Bob on the River (because he lives on a houseboat and they "bob" in the water as they float) and who lives in Topock, Arizona said that he had seen the object as it flew over. He thought it was on fire. He didn’t see it hit the ground, given the terrain, but he did hear it. He told Knapp that it smacked into the sand. Bob tried to call for help, but his satellite phone wouldn’t work. Not long after the crash, however, he heard the pulsating beat of rotor blades and saw five helicopters in a loose formation heading toward the crash site. One of them broke off to circle his houseboat and then rejoined the others. These might have been Huey’s, though it seems that’s a name applied to many helicopters. I suspect that they were Black Hawks, but no matter. The helicopters located the wreck and according to Bob on the River, the fifth helicopter known as a Sky Crane retrieved the object. Although unseen by any of the witnesses, some of the helicopters had to land so that the object, whatever it was, could be rigged for lifting. Bob said that the object, still glowing, was airlifted from the site, and carried away. All the helicopters went with it. Had Bob on the River been the lone witness we might have been able to dismiss his story as the musings of a loner who lived on a houseboat. This is not to mention that not long after this happened, Bob disappeared. Frank Costigan, once the chief of airport security at the Los Angeles airport and a retired police chief and a man who would seem to be more credible than Bob, said that he had seen the object when he got up at three to let out his cat. He said that he knew the object was not a meteorite because it seemed to changed speed. According to Costigan, it was bright enough to have illuminated the ground. It disappeared behind some hills and didn’t reappear. Clearly it was down. In a bizarre incident, David Hayes, the owner of KTOX radio in Needles, said that on his way to work he saw a strange assortment of odd vehicles getting off the highway. 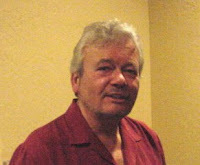 He produced a rough drawing that he showed to George Knapp (seen here). This seemed to be a "Men in Black" sighting. There were all sorts of other, seemingly related events. According to what Knapp learned, "Out of the blue the station got a call from a friend in Laughlin [also on the Colorado River] who said the Laughlin Airport had been inundated on the night of the crash with so-called Janet planes. That’s the airline that flies workers to top secret Area 51. Costigan says the airport could not confirm this because no one is on duty after 6 p.m... not even the tower." Knapp continued, "The black vehicles have left Needles. Bob the houseboat guy can’t be found either... The point is, something definitely happened." Knapp, of course, continued the investigation. He learned that the vehicles, sometimes black, were often seen in the Needles area and he, along with his camera crew were able to spot and photograph them. Knapp said that he joined in the formation as it drove down the road. One of the vehicles eventually pulled over and Knapp did th same thing. There was an encounter with the crew, who were armed and who suggested they were federal agents. One of them flashed an ID at Knapp who said that he hadn’t gotten a good look at it and was shown it again. Eventually the confrontation, if that’s what it was, ended and everyone went on their own way. 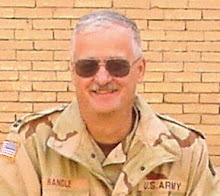 Later Knapp received a call from a friend with the Department of Energy who told Knapp he was lucky that the confrontation ended as peacefully as it did. Knapp would learn that these agents, black vehicles and all, had nothing to do with the UFO crash, if that’s what it was, but with a very real and security-wrapped federal mission. Knapp would be the first reporter allowed to see the training of the agents. These dark vehicles, often on the roads around Needles had nothing to do with the object’s crash. So, one mystery solved, but what happened to Bob on the River? Knapp eventually found him and talked to him at length about what he had seen. Bob on the River couldn’t add much to the descriptions that others had, or rather, he had given to others. The object struck with a thud, like something smacking into sand. Knapp said, at the Crash Retrieval Conference that he knew Bob’s real name and even showed us video of the interviews that hadn’t aired on Las Vegas television. Bob told a solid story and his somewhat unorthodox life style didn’t play into it. Bob on the River had seen something fall out of the sky. Knapp, in his presentation made it clear the helicopters had been on the scene in less than twenty minutes and that meant that someone, somewhere, had been monitoring the progress of the object. Someone, somewhere knew what it was. Knapp gave the impression that he didn’t believe it to be of extraterrestrial origin. The next day, meaning the next day after Knapp’s presentation and not the next day after the crash, I had a chance to talk to Knapp about this. He told me that he believed, based on what he had seen and learned, that the object was an experimental craft that had failed. The helicopters got there too fast for anything else. In the end, there are two solutions to this. One is the extraterrestrial, but that seems to be the least likely. The other is that this was an experimental object, probably some sort of advanced unmanned aerial vehicle (UAV) belonging to the US government. They retrieved it before anyone in Needles or Topock got a good look at it. At the moment, that is the explanation that I prefer.